December 12, 2018 Yonkers, NY — Sarah Lawrence College’s Center for the Urban River at Beczak (CURB) and Beczak Environmental Education Center have been awarded two NYS Department of Environmental Conservation grants, totaling $135,000 to help advance environmental knowledge and stewardship of the Hudson River and urban watersheds. “These new grants will allow the Center for the Urban River to build on the scientific research, education and community outreach we are already doing, but will add a new and exciting dimension: updated High School level curriculum with a focus on science skills and college preparedness, and a youth corps of students who can take what they have learned at CURB and in the classroom and go out into the community to achieve positive change toward a cleaner environment,” said Ryan Palmer, director of the center. The $100,000 Community Impact Grant through the DEC’s Office of Environmental Justice announced last week by Gov. Andrew Cuomo’s office will work on two fronts: continuing CURB’s water quality monitoring program in the Hudson and Saw Mill Rivers and creating a youth corps of high school students from Lincoln and Saunders High Schools in Yonkers. Students will perform water testing and lab work, learn about the importance of clean water, and then create an informational campaign to educate the community as part of a paid internship. CURB has also been awarded a $35,841 Hudson River Estuary Grant for River Education from the DEC’s Hudson River Estuary Program. This project, which also focuses on Yonkers’ high school students, will develop a new water quality curriculum that will be shared with the community. As a part of the program, more than 400 Yonkers students will get to visit the center for field trips over the next two years and receive follow up mentoring while they conduct research projects as part of their classwork. CURB, which opened its field research station in Yonkers in 2013, works with environmental partners to conduct research and monitor water quality on the Hudson River and urban watersheds. Each year, the center conducts more than 200 environmental education programs for 5,000 K-12 and college students plus hundreds of teachers. It also hosts community programs and special events, most free and open to the public. As part of the Community Impact Grant, students in the Program for Scientific Inquiry at Lincoln High School and the Bio-Chem Technology Program at Saunders High School will attend a “Water Academy,” a three-day intensive training held at CURB over winter break. The course will serve at least 20 students a year, and include lessons on the Hudson River, urban rivers, stormwater, sewer overflows, and hands-on training in field sampling and lab work. 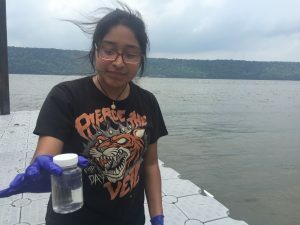 Of those students who complete the “Water Academy,” 10 will be selected for a paid internship on the “Yonkers Blue Team” to do water quality research and community outreach over the summer. “To reach a wider audience, the Blue Team will also work to create a clean water outreach campaign using videos, posters, social media ads, graphics/logos, and/or messaging – all in their own words in a way that will have a higher likelihood of connecting with young people in the community. Once it’s ready we will use our close connections with City of Yonkers, Yonkers Public Schools, and partner organizations to host a launch event and get the message out city-wide,” said Palmer. As part of the Hudson River Estuary Program grant, in addition to Lincoln and Saunders High Schools, students from Yonkers Middle High School’s International Baccalaureate Biology, or IB Bio, program will take part in educational field trips and mentoring from CURB staff. And finally, in the program’s second year students from NYC’s High School for Environmental Studies will be added to broaden the extent of the research and provide the opportunity for cross-cultural learning. In addition to the student and community education components, the Community Impact Grant will also fund scientific research and build on CURB’s four-year water quality monitoring program that has tracked sewage and other water pollution in the Hudson and Saw Mill Rivers. The biggest contaminant is storm runoff and sewage overflow from the sewage system during heavy rains. Palmer said the sewage overflow can pose health risks to residents who are exposed to contaminated water through recreation like swimming, kayaking, playing, wading, and fishing or through exposure from flooding and storm surge in the streets, businesses, and homes. He said while the rivers are clean and swimmable most times of the year, the perception of pollution discourages water recreation which can adversely impact tourism and recreational industries. Both grant programs are funded by the NYS Environmental Protection Fund. CURB began in 2013 when Sarah Lawrence College entered an alliance with the Beczak Environmental Education Center on the banks of the Hudson River in downtown Yonkers. The collaboration allowed the College to establish a research field station, facilitate faculty and student research, while continuing environmental education programming about the river for school and community groups. In addition to providing hands-on, K-12 environmental education, CURB works with partners such as the Riverkeeper to perform studies to look for ways to combat sewage and other contamination of river water. DEC’s Office of Environmental Justice offers Community Impact Grants to provide community-based organizations with funding for projects that address various environmental and public health concerns. The program has a particular focus on low-income and minority communities that have historically been burdened by environmental problems. The Community Impact Grants empower stakeholders to be actively engaged in finding solutions to the disproportionate burdens that EJ communities may experience. DEC’s Hudson River Estuary Program helps people enjoy, protect, and revitalize the Hudson River and its valley. Created in 1987, the program focuses on the tidal Hudson and its adjacent watershed from the federal dam at Troy to the Verrazano Narrows in New York City. This entry was posted in Press Releases and tagged education, Environment. Bookmark the permalink.